Succulent blackberries perfectly complement the tangy lemon curd topping on these tender, light and fluffy silver white cupcakes. 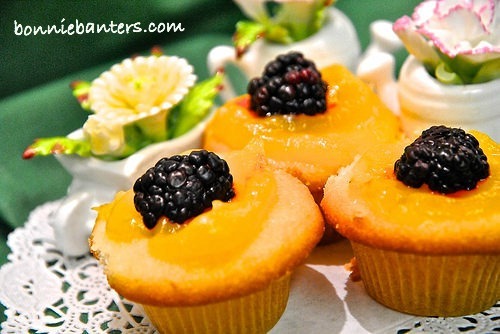 The mini-cupcakes (as in the photos below) make a lovely bite-sized dessert for spring or summer parties, or showers for babies or weddings. We thoroughly enjoyed these tantalizing cupcakes at a recent get-together for my daughter's birthday. I adapted them from a recipe for Silver White Cake, which was one of several easy one-bowl cake recipes offered in my vintage Betty Crocker's Cookbook, First Printing, 1969. To Celebrate Spring or Summer!